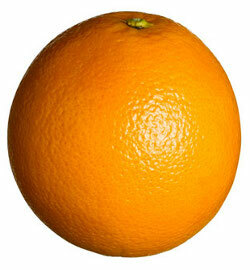 The orange is a type of citrus fruit that is very closely related to lemons, limes, tangerines, and grapefruit. Typically an orange of any variety will have a stringy core that contains the seeds, followed by a series of segments that contain the fleshy fruit, and then a thick orange colored skin protecting the fruit and seed from damage. Oranges are the most popular of all citrus fruits, and behind apples are also one of the most popular fruits grown and consumed globally. Many Americans start their morning with a glass of orange juice, and orange flavored treats are increasingly popular. Orange trees originate in in India, with some varieties being found in the south east of the country and possibly the island of Ceylon, whilst other smaller varieties may have originated in forests of the north east of the country or Bangladesh. The varieties of the north east were used as long ago as 7,000 years ago in traditional dishes, and were known to the Aryan people who were responsible for the Vedic scripts of ancient India. Apart from desserts, orange peel and juice has also been used in Indian savory dishes for thousands of years, sometimes to flavor rice, or add an orange tang to certain vegetable dishes. Archeologists and historians believe that by the beginning of the first millennium Chinese farmers were setting aside land for orchards and growing oranges, apples, figs and a variety of other tree hanging fruit. Certainly at the height of the Zhou dynasty, and in the times after when the states were warring against each other, many of China’s greatest administrators were writing about the virtues of keeping orchards rather than relying foraging for fruit. Oranges and apples in particular were very popular amongst the nobility and orchardists were known to compete with each other for the pleasure of their lord by growing ever larger, sweeter, or more perfectly rounded fruit. The first time an orange was seen in Europe can be traced to the Roman Empire, probably around the time of the first century when Roman traders were in regular contact the Persians, and the Axum Kingdom in present day Ethiopia, whose sailors were known use the monsoon winds to trade with Southern India and Ceylon from around 150 BC till the Kingdom’s collapse around 700 AD. Oranges from the seafaring Tamil kingdoms of Southern India were exported to the Roman Kingdom, and became popular amongst the noble and military classes who could afford these luxuries. The first orchards planted with oranges in the western world occurred in North Africa, from Libya to Morocco from the 1st century AD, and were initially owned by Roman settlers, and tended by slaves, and much of the fruit from these orchards found its way across the Mediterranean, though the best produce was still shipped from India for wealthy people in Rome. After the collapse of the Roman Empire in the 6th century, and the growth of the Islamic Caliphate from the 7th century these trading routes closed and orchards in North Africa, which were now controlled by Islamic lords reoriented their trading routes toward Baghdad, and the lands of the Middle East. The few Roman orchards that grew oranges in the European territories fell into disrepair as the medieval era took hold. During the golden years of the Islamic caliphate in North Africa and Southern Spain around the 11th century, oranges were once again imported into Europe, and seeds from Persia planted in orchards throughout Al-Andaluz, which in those times included most of Southern Spain, Southern Portugal, and parts of Northern Morocco. These oranges contained more pectin, and a thicker skin than previously known varieties, and are an excellent orange for liquers, marmalades, compotes, and can be made into essential oil for perfumes. The name Seville Orange is reserved for these varieties. Sweet oranges, in contrast to the bitter oranges previously mentioned, weren’t imported into Europe until the 16th century when Portuguese traders finally discovered a trading route around the Cape of Good Hope to India. Sadly we have no record of who first brought Indian oranges back to Europe from the Tamil kingdoms, though we do know that these sweeter varieties quickly became established in orchards all over the Southern European countries from Portugal to Georgia. 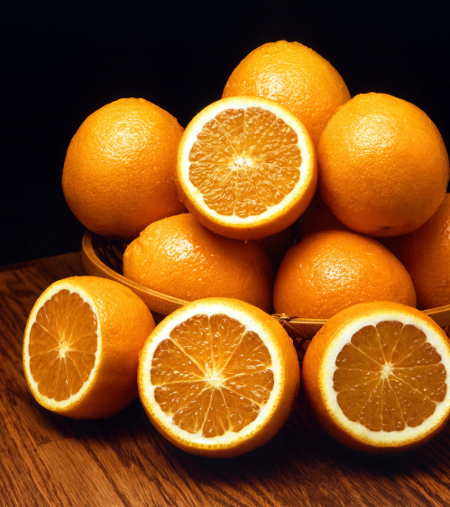 In fact in most Mediterranean languages the sweet orange is known as the Portugal orange. Within just a few years of their introduction to Europe, those same sweet oranges were also being exported to the Americas by Spanish explorers and conquistadors. Orchards were established in Hispaniola in 1493, and in Florida by Juan Ponce de Leon, the Spanish discoverer of La Florida (todays US state of Florida), and records indicate the orange trees were planted in 1513, the year of Ponce de Leon’s first sailing to Florida so that future sailors would be able to protect themselves from scurvy. To this day the State of Florida is the second most productive orange growing area in the world. Brazil claims the honor of producing the most oranges, accounting for about half of all the world’s oranges, most of which are grown in the state of São Paulo. Portuguese explorers first arrived in South America at the end of the 15th century, but oranges are not believed to have been imported and planted in orchards until the beginning of the 16th century on an island of the São Paulo coast known as Cananéia, which these days is a small coastal city heavily dependent on agriculture such as oranges. I think you need a little more backround on your topic. You just have random facts and only little history. Thats what you need to definetly add.